Dan Mitchell posted this beautiful shot to the Yosemite Blog Flickr Group. He always takes such nice photos. 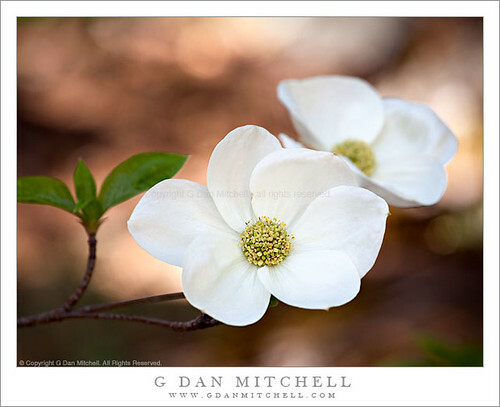 Dan: Yes, another dogwood… but, hey, it is spring and the dogwoods are (or were) blooming! These were photographed in Yosemite Valley in early May of this year on an intense one-day photography trip to The Valley. I shot this one during more or less the midday hours, rather than during the more typical early/late light. However, this has its advantages, too, if one can find good shade with open illumination. The color balance at this time of day seems to go more toward balanced white and the broken and filtered light on the ground makes an interesting background. Hey if you like Dan’s photo be sure to check out his blog where he posts another beautiful photo (sometimes more) every day. You can find it at gdanmitchell.com. He’s got a really beautiful photo of downtown San Francisco up today. Photo by G. Dan Mitchell.